I had to admit that the main reason that I requested These Broken Stars by Amie Kaufman and Meagan Spooner is that I love the pretty cover. The sparkly stars, her red hair, that billowy green dress... I wouldn't normally think of science fiction as being my sort of thing but based on how much I've enjoyed this and other recent scifi YA books, I think it's time that I changed my mind. 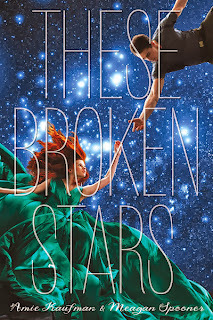 Because These Broken Stars was really interesting and quite romantic and very quickly I became quite emotionally invested in both main characters, their stories, their survival and this very strange planet that they've landed on. These Broken Stars is told with a dual-perspective between Lilac and Tarver, two characters from very different backgrounds and experiences. They meet aboard this swanky spacecraft shortly before some malfunction causes the Icarus to leave hyperspace and crash on a distant and very mysterious planet. Tarver and Lilac are forced into working together with the shared goal of surviving and of being rescued. I think the large majority of the story - in which Tarver and Lilac have to switch quickly between haughty socialite and decorated war hero into two people stranded who need to gather food and supplies in order to survive - was one of my favourite aspects. Lilac in particular struggled to drop the social graces that she's grown up with and become less stuck-up and precious about every little thing but at the same time she was no wilting flower either. Kaufman and Spooner gave us two very wonderful and complex characters who were capable of rescuing one another. I really, really love reading stories about survival. There's something about doing what needs to be done and pushing one's self to the limit to do these things that appeals to me. And I loved the strength both physically and mentally both Lilac and Tarver possessed to get through this ordeal. I also loved how the authors developed both of the main characters. Both Tarver and Lilac felt real to me reading this book. They had personality and life experiences and I was really able to connect with both of them and cared about who they are as people. I also loved the way they interacted with each other. With disdain at first, mostly which turned into grudging respect and finally into more. I loved the gradual changes in their relationship and by say, mid-way through These Broken Stars I was fanatic about their relationship and that really took me by surprise. Another surprise is what lies at the heart of the mystery surrounding this empty planet and the amount of shocking twists and turns to this story. 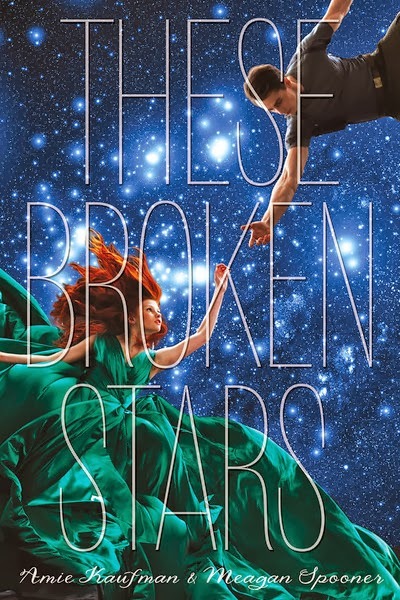 These Broken Stars is a book that really grabbed my attention and I will certainly be looking out to read both more in this series and more YA scifi! Ooh, this sounds really good! I musts admit that I was actually a little put off by the cover - it is pretty but I've read a book with a boy and girl falling and reaching for each other's hands like they are on this cover, and it was... Not so good. But I'll be keeping an eye out for this now, lovely review!